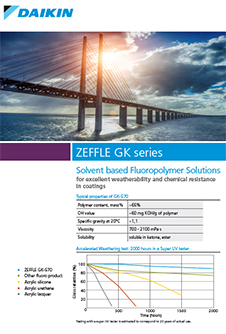 ZEFFLE™ GK-510 by Daikin is a solvent-based fluoropolymer solution designed to impart excellent weatherability and chemical resistance to coatings. 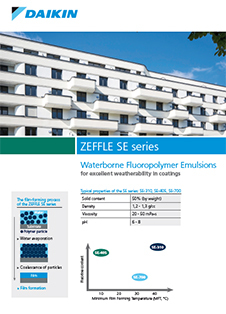 It helps in high inorganic pigment dispersion, gloss retention and exhibits durability, heat or ambient cure for touch up. 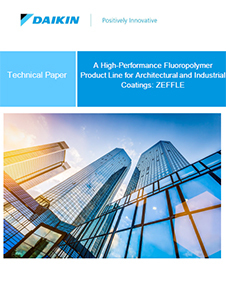 Coatings based on it can be applied to a wide range of substrates including steel, copper, aluminium, bitumen, concrete, wood, particle board, paper, paperboard, fabrics, plastics, glass. 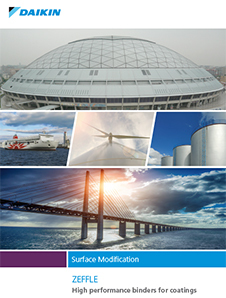 Suitable applications include architectural coatings, building and construction, automotive body parts, photovoltaic, tanks and heavy duty.